The Minnesota State Patrol has released dashcam video from a July 16 traffic stop involving a dangerous drunk driver behind the wheel of a semi-truck. 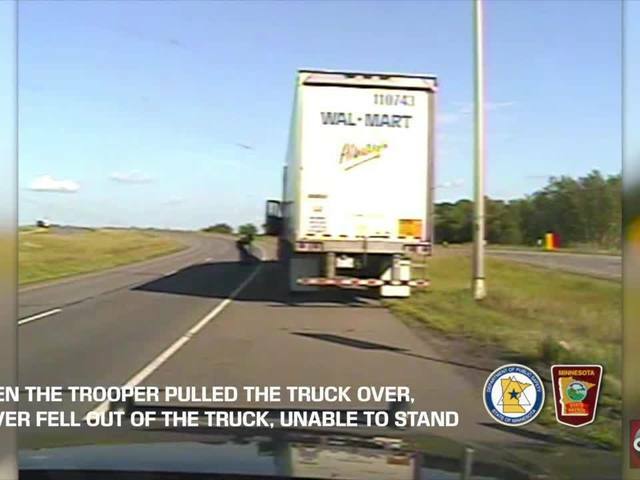 A trooper's dashcam caught it all on video as the truck swerved over the lanes of Highway 10, eventually coming to a stop on the right shoulder. The video shows Jonathan Czech, 45, of Isle, Minnesota, falling out of the truck and crawling on the ground. The driver was so intoxicated that he couldn't stand back up for several minutes. Troopers found two 1.75 liter bottles of vodka next to the driver's seat. Only one of the bottles was open and some of the vodka was gone. A breathalyzer test revealed that the driver had a blood alcohol content of .28 percent. He was charged with two counts of driving while intoxicated. Even though the driver was operating a Wal-Mart truck, he is not employed by Wal-Mart. He was working for Crete Carrier Corporation, a third-party transportation company. There are reports that the driver was fired from his job.